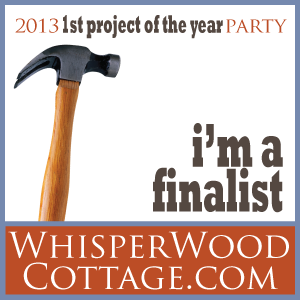 I've been spring cleaning and purging. I also have curtains to rehang, because I washed them, but I decided to rearrange my porch console mantel on the sleeping porch. I have not finished, but I took photos. The colors really make me happy. I really love the little shepherdess or shepherd. I also like to use ordinary bottles for vases, because I think they are pretty. The wreath is from last year, and there is a tutorial. 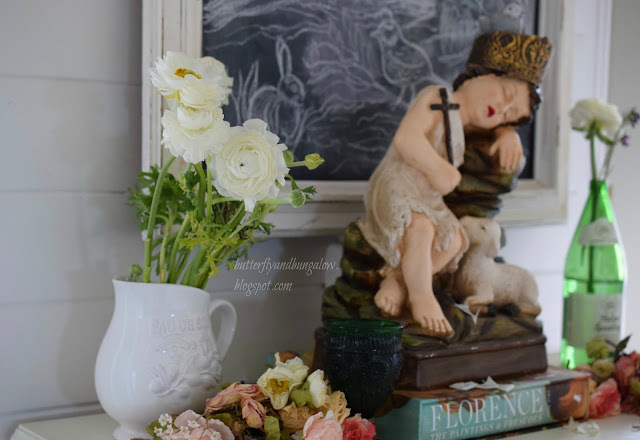 Beautiful mantel vignette. I love the figurine, very Italian! 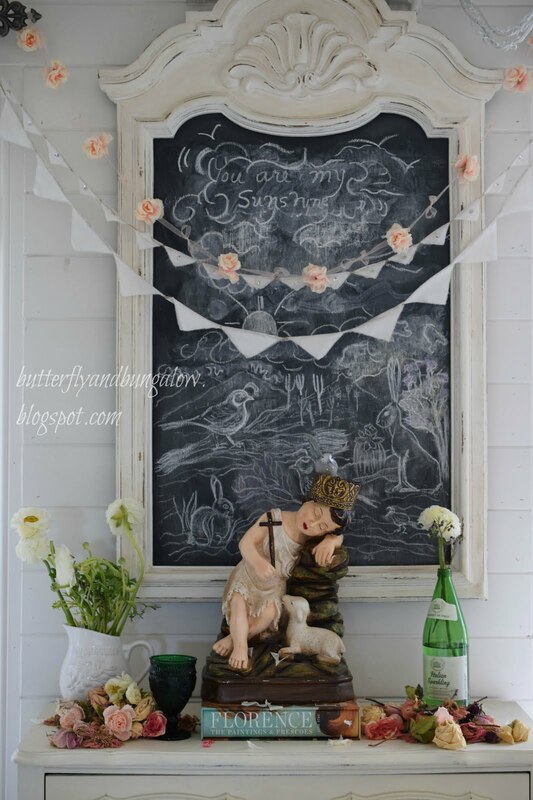 I love this and that wonderful chalk artistry as a background! Lovely - spring at your house is beautiful. 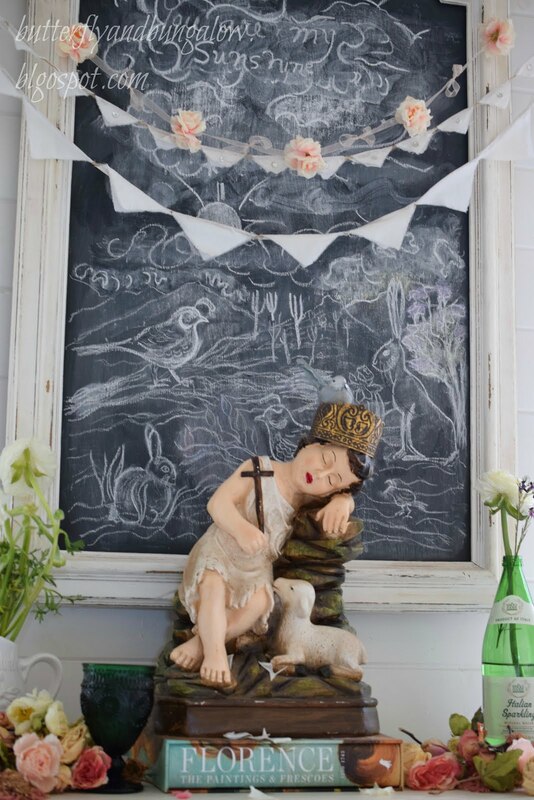 The chalk art is the perfect backdrop. Good evening Su, loving all your Spring time changes and color's. I have always loved your statue, simply gorgeous and the dried roses in your vignette adds softness and beauty. Nice share. Your spring mantel feels ready for Easter Su, and can't wait to see the changes it will take all the way up to that day Easter morning. 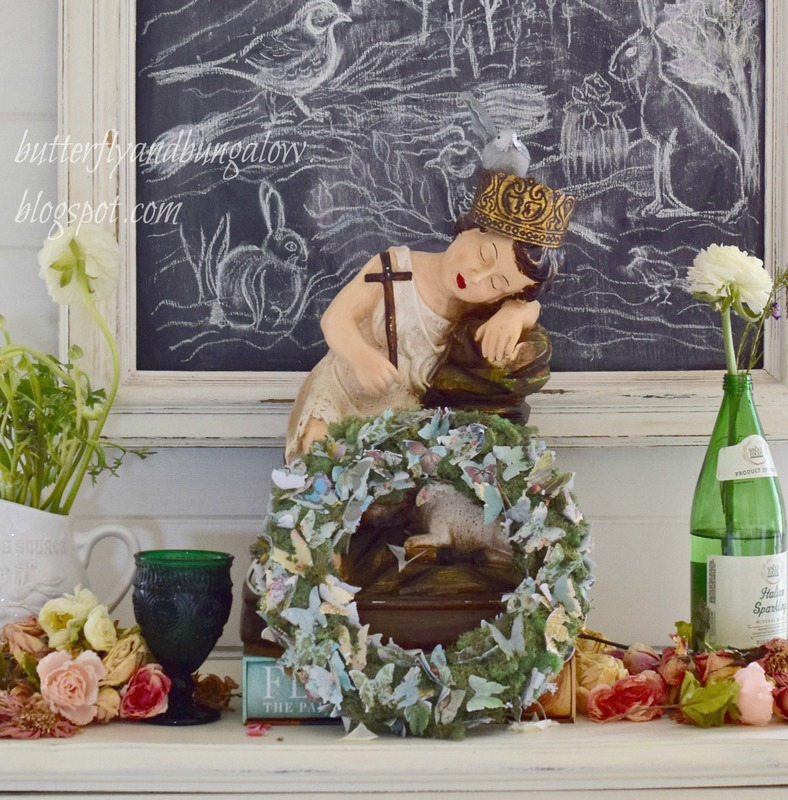 Love that you use bottles as bud vases, and it's nice to see your butterfly wreath has been added into this mantel vignette. Happy spring In the days to come. Your mantelpiece is such a wonderful sight! 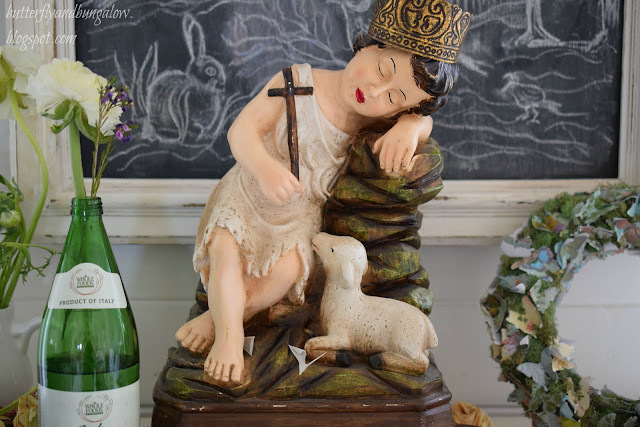 The little shepherd boy is adorable! I just love that figurine ! : ) What a pretty mantel arrangement! Love this Su. It is so pretty. I love that figurine too! Just adorable. Love it all. How fun. I love the look of the water bottles as vases and it is nice that you left the labels on. My sister is a dragonfly collector and I am thinking a wreath could be easily made with dragonflies as well. Thanks for including the link to the tutorial. I will have to see if I can find the Zuni legend. My sister started getting visits from dragonflies after my brother's death from ALS. She is convinced that they they are him. I believe it is a comfort to her and also to other family members. So cute, I love it and your beautiful photos! 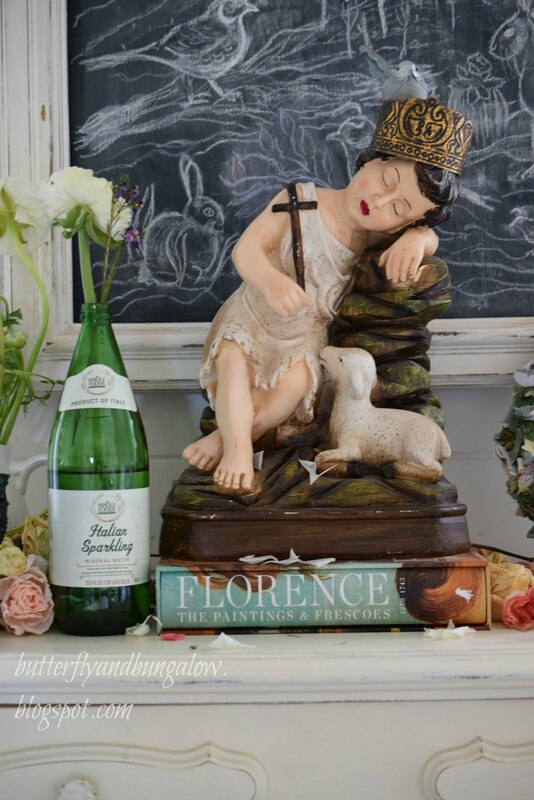 I feel so enchanted by your Easter mantel, sweetest Su, it's truly stunning, I'd love so much to find a statue similar to yours but I've never seen something like that in Italy, alas ! Thank you, Dany. I found the statue in a shop that sells "French" decor. Very pretty! 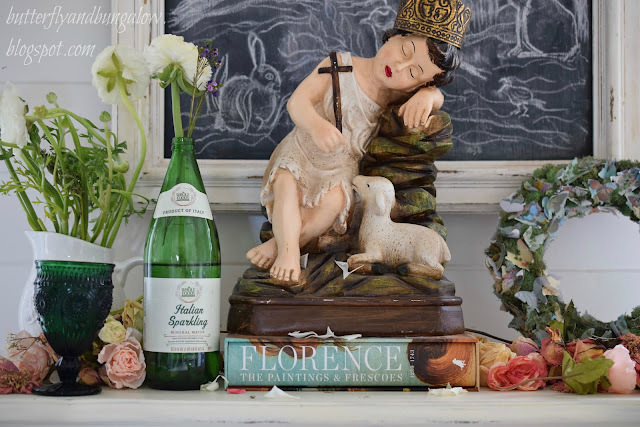 Love the figurine, the book, the flowers, the green glass. It's all lovely. So lovely. 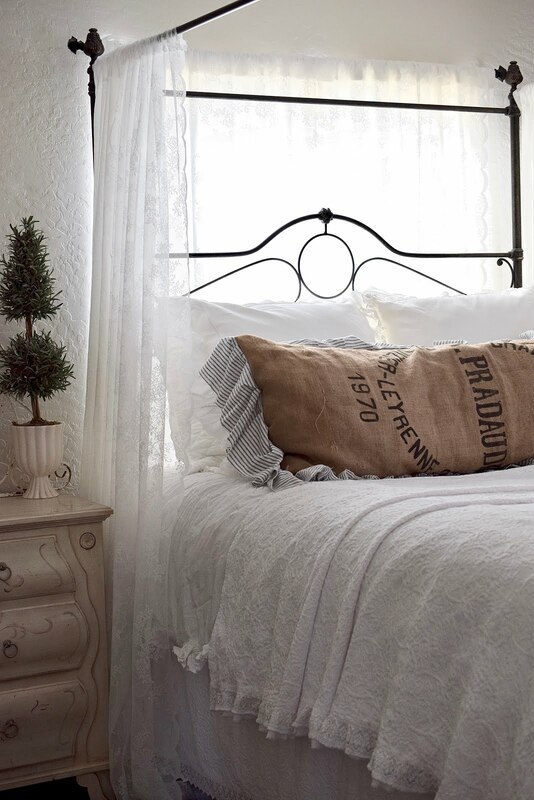 You have such a French look to your place, and you do it so well. Hi Su, wow, you created such a beautiful, unique spring mantel! I also love the shepherd figurine. It looks like it is antique and coming from a church or is it a reproduction piece? Wishing you a lovely rest of the weekend! Everything looks beautiful and serene, and I also love the colors. What I especially love is the idea of a sleeping porch. Your mantle is perfection!!! I truly love every thing about it! What a pretty Spring mantel...been working on mine but cant see to get it right! It hard to believe what your March garden looks like...I've just started to see buds and the only greens are wild onions and poppy leaves coming up! Su, the little shepherdess is such a unique piece. I love her and her sweet lamb! Very beautiful mantle. You have the prettiest home! Su, I love your gorgeous spring mantel and it totally makes me feel happy too! this is just beautiful, Su....love it. This is so pretty. I always love seeing what you do on your chalkboard. 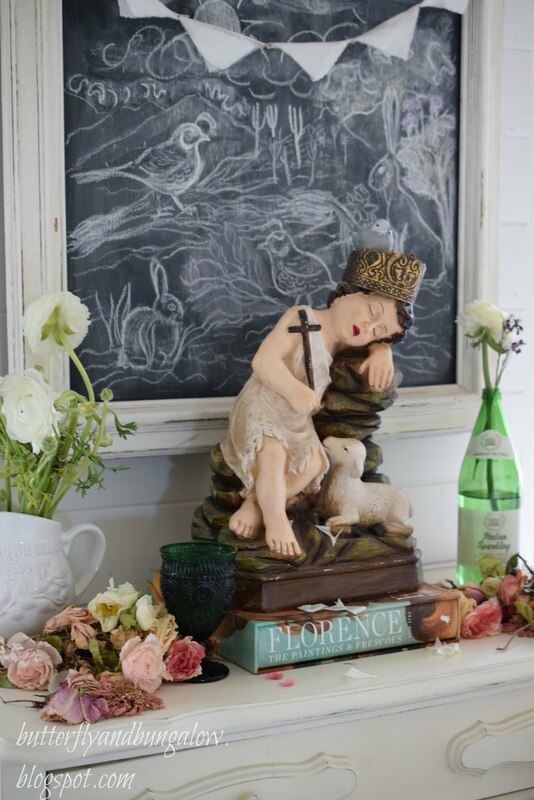 Today it's the perfect backdrop for your pretty little statue.